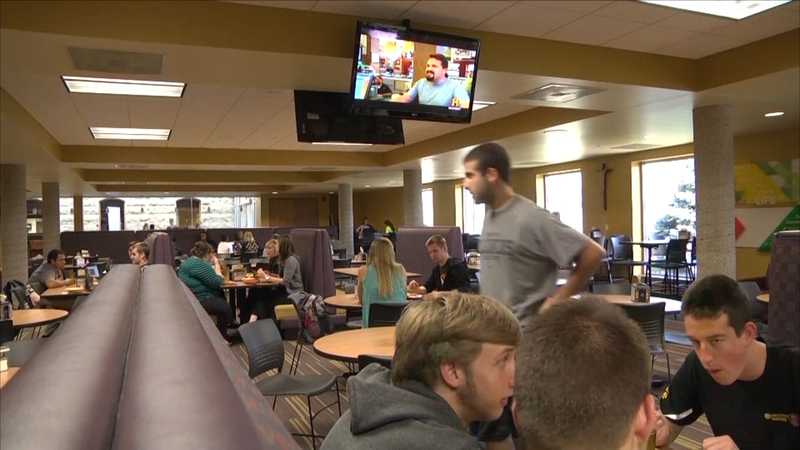 The Loras College men’s volleyball team came out this past weekend on a mission. The team was on the road to Naperville, Illinois to take on No. 8 North Central College this past Friday, March 22. Then on Saturday, March 23, the team traveled north over the border into Wisconsin to take on No. 1 Carthage college in Kenosha. The Duhawks remember the five-set win against North Central last year in the conference tournament, upsetting the first seed. The Duhawks did it again in conference-play upsetting the No. 8 team in the nation with a sweep. Ooms lead the Duhawks with 14 kills in the three-set-match while adding one of the 8 blocks on the night. Junior middle blocker Ian Walsh tallied four blocks and five kills that influenced North Central’s -.150 attack percentage. 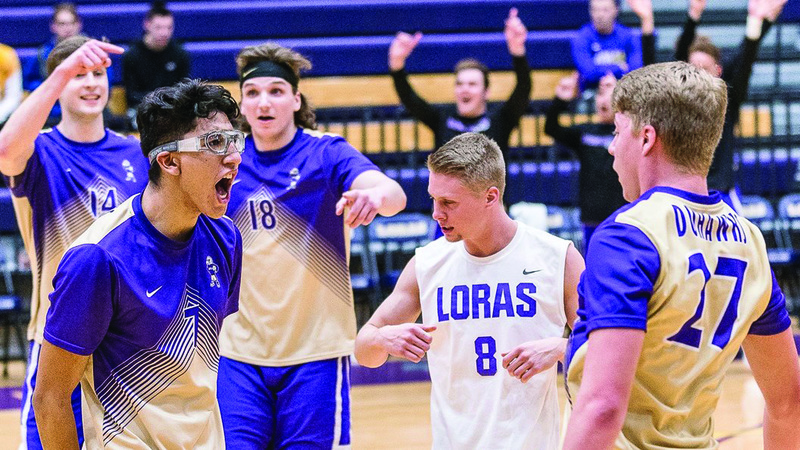 Loras celebrates a point scored during a match in the AWC. Sophomore middle hitter Andres Martinez (left) is expected to return this week from back injury. However, the Duhawks offense seemed unstoppable firing off a .478 attacking percentage in only three sets of volleyball. Sophomore setter/right-side hitter/defensive-specialist Patrick Hollander played a clean game with 35 assists and no errors. 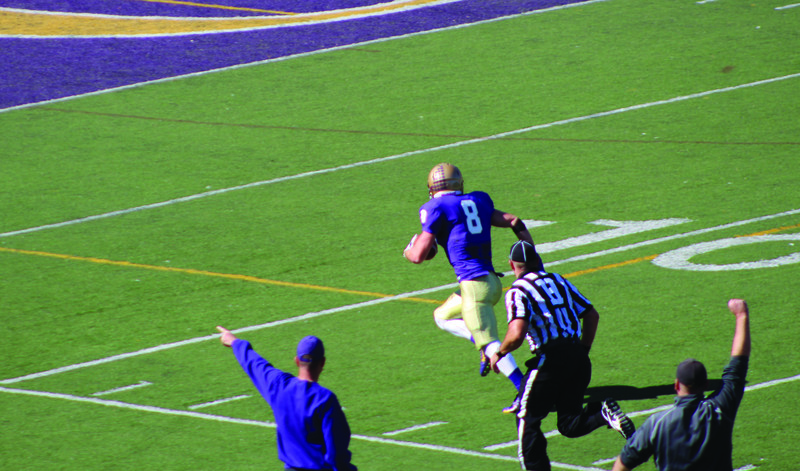 The Duhawks tried to carry this momentum into Kenosha, Wisconsin against No. 1 Carthage College. However, the start of the first set was a bit of a scare with the Carthage Redman going on a 5-0 run. Loras was able to answer back and level the score again at nine. The two teams were evenly matched before then. 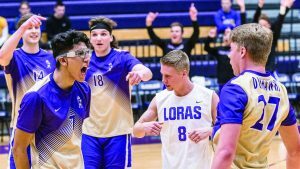 Loras and Carthage both battled playing great volleyball. Each team siding out after the next. Ooms led the Duhawks again finishing with a season high of 18 kills and 18.5 points. Sophomore outside hitter Mihajlo Gomez tied his season high of 16 kills. Gomez also tallied two aces and three blocks. The team will be traveling today, March 28, to Augustana University for a conference game starting at 7 p.m. which will also determine where the Duhawks will finish in post season. Be sure to check duhawks.com for updates and a live feed for score.